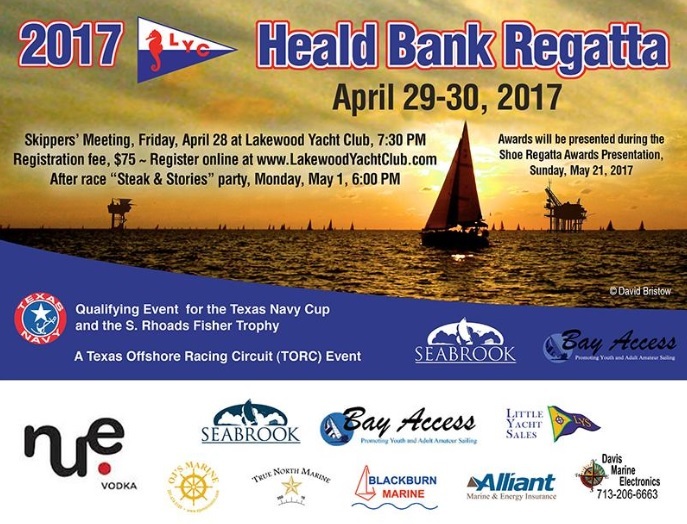 Lakewood Yacht Club and the Bay Access Foundation have announced plans for the 2017 Heald Bank Race Lakewood is hosting April 29 and 30. The classes of boats invited to participate are PHRF Spinnaker, PHRF Non-Spinnaker, Cruising Non- Spinnaker (Classic Canvas, i.e. Dacron sails), Cruising Poleless Spinnaker, One-Design and Multihull. Visit the LYC website at lakewoodyachtclub.com to view the Notice of Race or register before the April 26 entry deadline. Crew waivers and other valuable information are also available. The entry fee is $75 with a $5 discount available to U.S. Sailing members. Heald Bank Race is the first in the three-event Texas Offshore Circuit. The Houston Yacht Club Offshore Regatta and the Galveston Bay Cruising Association Regatta constitute the other two TORC events. Crew sailing in the PHRF Spinnaker Class will be eligible to compete for the circuit championship trophy, the Texas Navy Cup, if they enter all three races. Competitors sailing in the PHRF Non-Spinnaker Class in all three events will also be eligible for the S. Rhoads Fisher Trophy. For more information, contact LYC at 281-474- 2511 or race@lakewoodyachtclub.com or Bob Hunkins, Heald Bank Regatta chairman, at rdhunkins@verizon.net or 281-216- 4082.